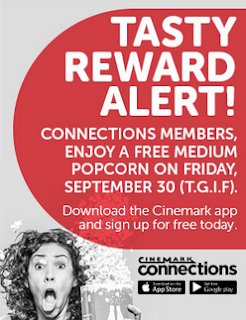 I am a huge fan of the Cinemark movie app as it used to just reward me with concession stand coupon for putting my phone in CineMode. Well now they offer Cinemark Connections as a part of the app and you can earn great prizes!!! When ever you go to the movie, just have the clerk s can your Connections QR code at the box office and concession stand. You can get a max of 30 points a day (10 points for buying tickets, 10 points for concession purchase and 10 points for turning your phone on CineMode). Plus you still score coupons for concession purchases by turning on CineMode! Watch your points roll in and redeem your points for awesome rewards like digital movie and music downloads, posters, trips/contests, premieres and more! Please note, this is not a sponsored post, just sharing a great way to earn freebies while hitting the movies!